You don’t have to be a balsamic sommelier to taste the difference between these amazing vinegars. As balsamics age, they go from being bright and tart to taking on a sweeter, more raisin-y flavor and a thicker, more syrupy texture. The young balsamics are better for vinaigrettes; the older ones are killer drizzled on cheese or berries. 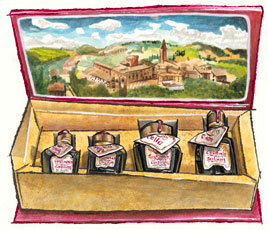 This collection of four bottles from our longtime source for balsamic, La Vecchia Dispensa in Modena, Italy, range in age from 10 to 30 years. Nestled in a beautiful box, they make a stunning gift.